Last night I dreamed that someone told me it would be okay to feed Monkey Chow to husbands. 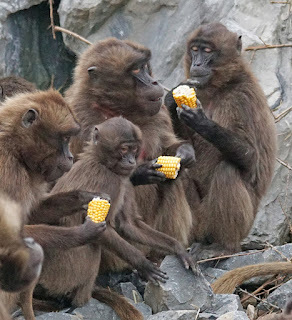 After all, they are all primates and can easily digest the same food. I was doubtful, until I realized that it would add some crunch to meatloaf. The unconscious mind is always creative. How does your husband feel about this? On the one hand, monkey chow. On the other hand, mmmmmeat loaf! Yep, I think that sums it up pretty well.